Internet tools have advanced to what people know as web 2.0 systems, where online communication within your network is much more accessible. 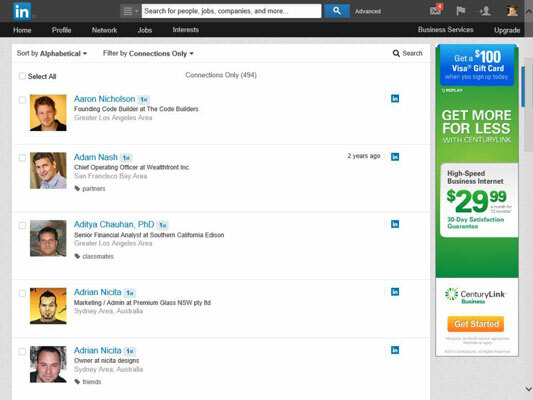 Sites like LinkedIn have started to replace the older ways of accessing your social network. For example, instead of asking your friend Michael to call his friend Eric to see whether Eric’s friend has a job available, you can use LinkedIn to see whether Eric’s friend works for a company you want to contact, and you can then use LinkedIn to send a message through Michael to Eric (or in some cases, directly to Eric’s friend) to accomplish the same task. In the past, you had no way of viewing other people’s social networks (collections of friends and other contacts). Now, though, when folks put their social networks on LinkedIn, you can see your friends’ networks as well as their friends’ networks, and suddenly hidden opportunities start to become available to you. This means you can spend more time doing research on potential opportunities (like finding a job or a new employee for your business) as well as receiving information from the larger network and not just your immediate friends. This makes the network more useful because you can literally see the map that connects you with other people. However, just because this information is more readily available, that doesn’t mean there’s no work involved in networking. You still have to manage your connections and use the network to gain more connections or knowledge. Remember, too, that nothing can replace the power of meeting people in person. But because LinkedIn works in the background to guide the way in finding contacts and starting the process, you spend your time more productively instead of making blind requests and relying solely on other people to make something happen. You made a connection with someone — say, your roommate from college. It’s graduation day; you give him your contact information, he gives you his information, and you tell him to keep in touch. As both of you move to different places, start new jobs, and live your lives, you lose track of each other, and all your contact information grows out of date. How do you find this person again? One of the benefits of LinkedIn is that after you connect with someone you know who also has an account on LinkedIn, you always have a live link to that person. Even when that person changes e-mail addresses, you’ll be updated with his new e-mail address. In this sense, LinkedIn always keeps you connected with people in your network, regardless of how their lives change. In the LinkedIn universe, the word connection means a person who is connected to you through the site. The number of connections you have simply means the number of people who are directly connected to you in your professional network. First-degree connections: People you know personally; they have a direct relationship from their account to your account. These first-degree connections make up your immediate network and are usually your past colleagues, classmates, group members, friends, family, and close associates. Unlike Facebook, where everyone you connect to is a “friend,” on LinkedIn, you can connect to friends who don’t necessarily have a work, school, or group connection to you, but are people who you know personally outside those criteria. Similar to Facebook, though, you can see your first-degree connections’ contact list and they can see yours. Second-degree network members: People who know at least one member of your first-degree connections: in other words, the friends of your friends. You can reach any second-degree network member by asking your first-degree connection to pass along an introduction from you to his friend. Third-degree network members: People who know at least one of your second-degree network members: in other words, friends of your friends of your friends. You can reach any third-degree network member by asking your friend to pass along an introduction from you to her friend, who then passes it to her friend, who is the third-degree network member. The result is a large chain of connections and network members, with a core of trusted friends who help you reach out and tap your friends’ networks and extended networks. Take the concept of Six Degrees of Separation (which says that, on average, a chain of six people can connect you to anyone else on Earth), put everyone’s network online, and you have LinkedIn. This account has 320 first-degree connections. When you add all the network connections that each of these 320 people have, the user of this account could reach more than 110,700 different people on LinkedIn. Add in third-degree network members, and the user could have access to almost 5.1 million members, part of a vast professional network that stretches across the world into companies and industries of all sizes. Such a network can help you advance your career or professional goals — and in turn, you can help advance others’ careers or goals. Of course, as of this writing, the LinkedIn community has more than 238 million members, and LinkedIn focuses on your first-degree connections instead of your second- and third-degree network members, but the concept is still valid. 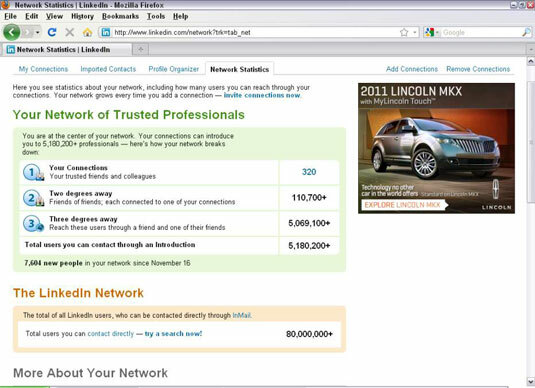 Your network can be vast, thanks to the power of LinkedIn.